The museum is celebrating its bicentenary throughout 2019 © Ignacio Hernando Rodríguez. 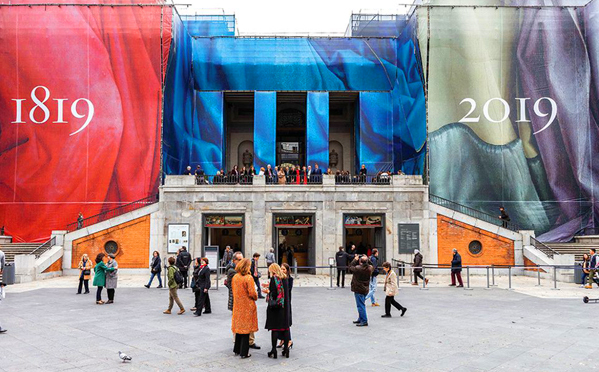 Released from the shackles of state control in 2003, the Madrid institution has reason to celebrate its bicentenary. Miguel Falomir Faus has a foot in two eras of the Museo del Prado. The Madrid museum celebrates its 200th anniversary this year, and Falomir is very much part of its history. Before becoming its director in 2017, he was the deputy director under Miguel Zugaza and the long-serving curator of Italian Renaissance paintings. Falomir’s distinguished work at the Prado includes surveys of Titian (2003) and Tintoretto (2007) and its late Raphael exhibition (2012). Zugaza shepherded the Prado’s transformation from a sleepy museum with a rich Old Master collection, an uninspired exhibition programme and a shabby building into a vibrant place that welcomes millions of visitors a year. “It had a tiny, tiny education department,” Falomir recalls, and “most of the time the shows were ‘Velázquez, Goya and El Greco’ and then ‘El Greco, Goya and Velázquez’”. Central to this shift was the Prado’s hard-won independence from government interference. Once, directors came and went with each political quarrel, creating uncertainty and malaise. “The Prado was sometimes a weapon,” Falomir says, “used by one political party against the other”. A law passed in 2003 gave the museum substantial autonomy, which he says has become a model for other national cultural institutions, such as the Museo Reina Sofia. Falomir, who projects a quiet confidence built on deep knowledge of his institution, must also guide the Prado’s future. Like many museum directors, he has to contend with a major building project. There remains one last piece of the Prado’s massive campus to renovate: the Salón de Reinos (Hall of Realms), once part of the royal palace complex and more recently Spain’s Museum of the Army. The British architect Norman Foster is designing its €45m refurbishment and Falomir hopes the Spanish government will provide three-quarters of the funds. Here, the Prado is not entirely immune from national politics. Spain is in “a very delicate political situation”, Falomir says, and the start of construction “depends on when the government passes a budget”. In imperial-era Spain, the Hall of Realms displayed large history paintings, among them The Surrender of Breda (around 1635) by Velázquez, Francisco de Zurbarán’s cycle of the labours of Hercules (1634) and royal equestrian portraits. Many of these pictures will return to the redeveloped spaces, alongside great works now in storage. The Prado has always had an intense curatorial mission, though its emphasis was the collection and one of the world’s finest conservation departments. Until the 1980s, the museum rarely hosted temporary exhibitions. This has changed and will continue to evolve under Falomir. Refreshingly, he believes that “the era of the blockbuster exhibition is over”. He prefers focused shows, distinguished less by their size, masterpieces and pedantic themes and more by exquisite works, many not by Spaniards, that explain Spain’s place as a crossroads of achievement in the arts. A display of Rubens’s rarely-seen oil sketches last year, for example, revealed how he drew from Spanish art and profoundly augmented it. The 200th anniversary programme includes an exhibition opening this autumn on two admired but overlooked female artists from Renaissance Italy, Sofonisba Anguissola and Lavinia Fontana. Another explores how Rembrandt and Vermeer informed Golden Age Spanish painting. The Prado’s early Renaissance holdings will gain more prominence, with the current acclaimed survey of the Spanish innovator Bartolomé Bermejo (until 27 January) and a forthcoming show devoted to Fra Angelico. Spurred by the 2003 law, the Prado has also struck out in the field of fundraising and is “doing well” despite Spain’s long years of austerity, Falomir says. Around 70% of its income is self-generated through ticket sales, which once went directly to government coffers, and corporate sponsors who “stayed supportive” even after the financial crisis. However, Spain’s philanthropic culture is “different from the Anglo-Saxon world”, Falomir says, as “donations of cash from individuals are exceptional”. He recently introduced the Prado’s first “micro-sponsorship” campaign, which in December successfully crowdfunded €200,000 from around 6,500 individual donors to buy a 17th-century portrait by the French painter Simon Vouet. Falomir foresees a steady rise in the number of visitors, driven by substance rather than glitter. In 2017, around 2.8 million people came to the museum, mostly from outside Spain. As a scholar, curator and now director, Falomir has seen the Prado evolve from an insular place to an active museum in constant dialogue with the public. Under his leadership, it looks like it has a dynamic third century ahead.